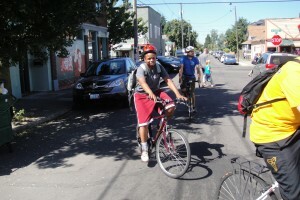 Every summer, our Bike Camp program works with Self Enhancement, Inc. interns to help lead our youth safely on the road. SEI is a nonprofit organization that helps “at-risk African-American urban youth realize their potential.” This season, we’ve had the wonderful opportunity to work with Kiara Berry who joined us at Bike Camp this July. Kiara is currently attending Portland Community College as a sophomore where she is pursuing a degree in Accounting, while playing on the women’s basketball team. 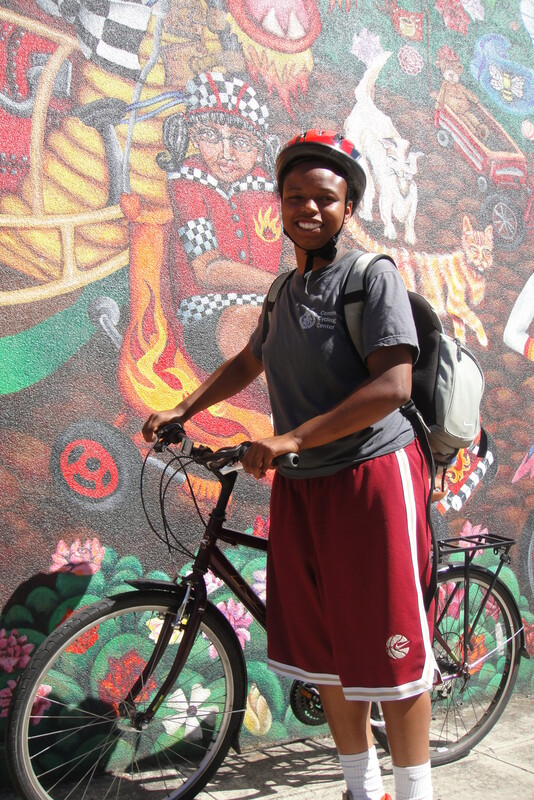 Kiara came to the Community Cycling Center not knowing what to expect, but she was excited about working with kids and riding bikes. Through our Bike Camp program, Kiara increased her comfort level with public speaking. She not only learned how to lead the campers through bike safety checks, but also to guide them through intersections on the road. Her favorite age group to work with was the Cruisers, ages 8-11, because she enjoyed seeing how quickly they learned bike safety education. Before Bike Camp, when Kiara encountered a flat tire, she would have just been ”out of luck.” Now she can point out various bike parts with ease and skillfully patch an inner tube. For her it has been a fun learning experience that not everyone has the opportunity to do. She appreciates that she gets some exercise during her internship, and has learned the art of patience while figuring out how to work with different age groups. When asked what superpower her bike would have, Kiara explains that “it would dish out money whenever she needed it.” I say that’s a pretty significant bike superpower. Having the support of Kiara during camp as well as her participation has had as much of a positive impact on us as it has on her. Thanks to our partnership with SEI, we can continue to empower kids in our bike camp programs, while supporting and training young adults in leadership development.